Thanksgiving – I Give Thanks for Portion Control! Thanksgiving has come and gone. So much to give thanks for – family, friends, food, and the joys of portion control. Traditionally, the Thanksgiving meal is my meal to prepare. I always thought I got the easiest of the holidays in my family. What’s hard about cooking a turkey? You throw it in the oven and forget about it for five hours, what could be simpler? Of course, you have to stuff it first, and I make some of the best stuffing in the world! This year, I had a couple special considerations for the meal preparation this year. First, I needed to keep in mind my own journey and to make sure I didn’t self-sabotage my efforts thus far. Second, my 89-year-old father is on a severely salt-restricted diet. Keeping those two goals in mind forced some changes from my normal Thanksgiving meal preparation. In recent years, I’d foregone making the mashed potatoes from scratch. Publix supermarket makes superb real-potatoes mashed potatoes, it hardly seemed worth the effort to do it myself anymore. But checking Publix mashed potatoes and then looking at the other various pre-pared potatoes available on the market, I found that all were terribly high in sodium. So, this year I once again made my own mashed potatoes from scratch. I bought the Gold potatoes and boiled them in pure, salt-free water. I kept the skins on, to add flavor and keep the natural nutrients. I added no salt to the mash, but did add lots of other spices. Thinking of me, this time, I kept the butter out and instead added fat-free sour cream — but added the whole milk, which I love. The potatoes were a great success and I even got to enjoy them myself, in moderation, of course. I bought canned gravy, but that’s nothing new. The only woman in my whole family who has ever been able to make gravy from scratch was my adorable Great-Aunt Pauline. When she passed, she took the recipe with her, and thus ended the era of scratch gravy in our family. I was delighted to see that Heinz bottled gravy is only 35 calories per quarter cup. So I could enjoy gravy with my golden potatoes — in moderation, of course. I didn’t want to muck with my traditional stuffing, so the recipe remained the same. So, I had to severely moderate my normal consumption of it. But it was nice to see the family enjoy the stuffing as usual. Just because I’m obese doesn’t mean my family should be deprived. For decorations, I made the cutest little cornucopias for each person’s place at the table. They were very simple to create. Just take an ice cream cone and dip the edge in chocolate. Then sprinkle with gold sugar and let dry on some wax paper. On thanksgiving morning, just fill them with a mixture of Chex mix, peanuts, and candy corn pumpkins. 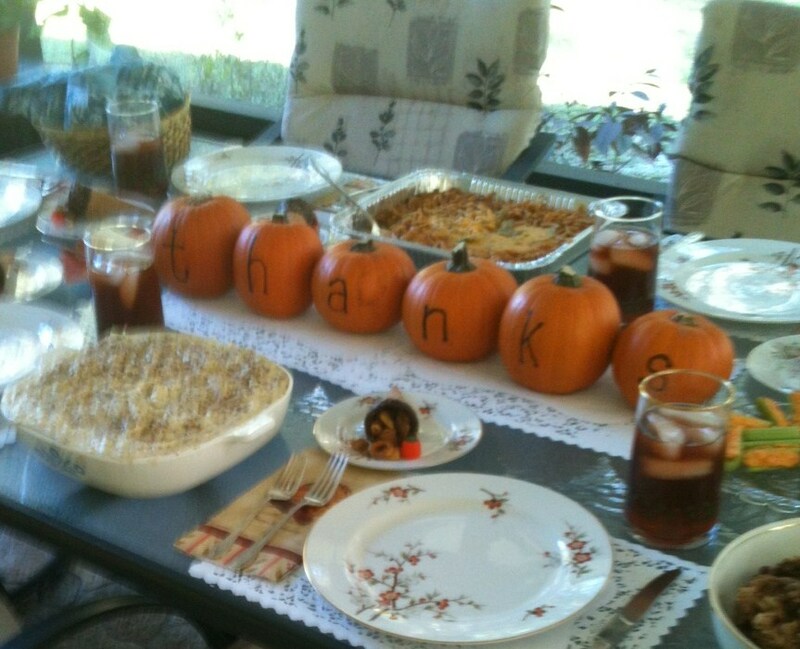 I also used pumpkins with THANKS written on them for the centerpiece. Best of all, when making the cornucopias, I wasn’t even tempted to dip into the chocolate. 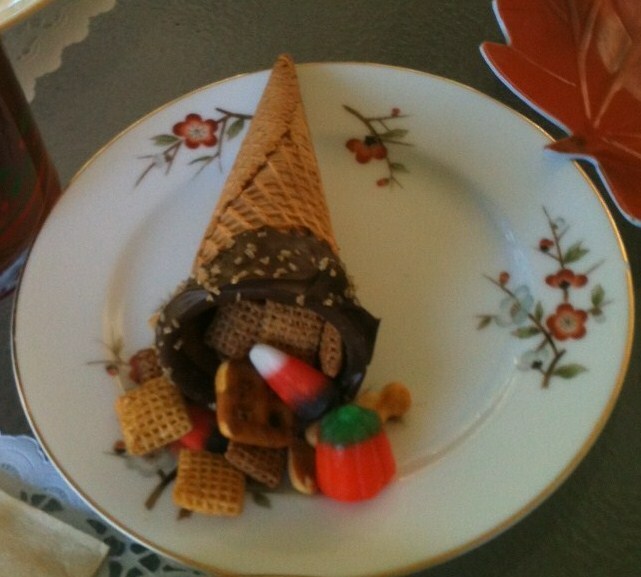 And I didn’t eat any of my own of the cornucopia contents. I stuck to what I was really looking forward to: turkey, mashed potatoes and gravy. I did have the desert that friends had made and brought. Vicki made chocolate and peanut butter cake which was no sodium. It was delicious! They insisted on leaving the uneaten portion of the cake. I thanked them for it, and made sure that I didn’t have another piece and just brought the cake to share at coffee hour at church. Wow! I have really made progress on my journey. In the past, that cake wouldn’t have lasted a day in my house. Give thanks for successes on the journey! Woohoo! Lost three pounds this week. I’m going to need that buffer pound going into Thanksgiving. Plus my brother is coming to visit for two weeks. That’s going to be a challenge on my goal to lose 41 pounds for Christmas. I’ve got just four more pounds, but during the holidays, that’s going to be a challenge.